In the July 5th post Vacation, I mentioned that a lot was going on. Now I can elaborate. Meet Ian, Jill's and my contribution to the riches of the city! Dan's Pixieland shirt (the long vanished amusement park near Lincoln City) by Portland's own Vintage Roadside. 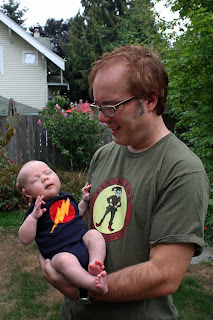 Ian's Flash superhero onesie from Milagros on NE 30th. Two months ago I could not have even told you what a onesie was. Invitation- On Saturday October 3 at the Architectural Heritage Center, I will be giving a presentation called The Rise and Fall of the "Great Light Way" Downtown Portland's Historic Third Street. It is the story of downtown Portland's move inland away from the river and one streets effort to halt the process. It expands upon numerous previous posts on this site, enhanced by a trove (!) of images from the AHC's research library. Tickets can be purchased here. Yet an other great post and conrats on what my Grandmother would call "A fine big baby boy"! 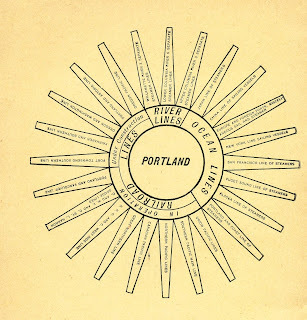 "The Rise and Fall of the 'Great Light Way': Downtown Portland’s Historic 3rd Street" was a splendid program. Thanks to you and to the AHC, once again--I say that because I enjoyed your Cast Iron Portland Walk, too! That little boy is darlin'! It's nice to hear the news. Thank you for sharing!